Transportation Costs > How Much Do Shipping Containers Cost? Cargo containers, made from a modular, stackable material, are storage containers that can be used to store different types of product used for trade and shipping. These containers are designed to handle virtually all elements since they will be stored outside most of the time. Aside from being served as a way to ship goods via a truck, train or boat, containers are often used on business and home premises. They can also be shaped by architects to turn them into a home or office. The price of cargo containers usually depends on the size of container, the amenities inside, condition it’s in and the number you purchase at once. 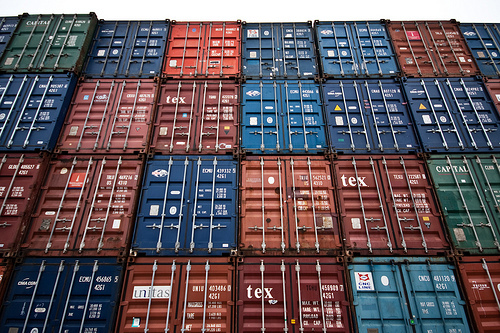 On average, cargo containers can cost anywhere from $1,500 to as much as $4,500+ for just the container. Since it’s too expensive to ship the containers back to where it originated from, most will sell after they have been unloaded. Cargo containers near a popular port will be much cheaper to transport than one that’s not. A 20-foot container can cost $1,700 to $3,400. A 40-foot container can cost anywhere from $2,000 to $4,700, while a hi-cube reefer refrigerated container can cost $8,000 to $9,500. A Conex box, which is often a popular brand purchased online, can cost about $1,500 to $2,500 used for a 20-foot container. A smaller 10-foot container can sell for as little as $1,500 to as much as $3,400. A 60-foot x 60-foot steel container, made of a heavy duty BLUFF steel and full-width stiffener for added strength and stability, can cost $1,200 to $1,500. For example, EquipmentTrader.com lists a 2002 A-plus grade A cargo container for $2,000 to $2,400. WikiHow claims an as-is container can cost $1,500 and a like-new or a modified container can cost $5,000 to $8,000. Modified shipping containers, which may have at higher prices, and these containers could have air conditioners, heaters, skylights, vents, fans or fully customized to be livable. Due to the many customizations, it’s hard to price these because it’s like a home — there are a lot of factors involved. Cargo containers will commonly be 20 or 40 feet long and common heights will include 8.5 and 9.5 feet. Most will be 8 feet wide, but extra wide containers are available and can measure up to 48 feet in length. Common names you will see will be either standard, which will have a standard 8.5-foot height, or high cube, which will have a 9.5-foot height. Most cargo containers are going to be considered a “dry van” with double doors. Higher-end premium cargo holders can have a refrigeration system to keep the items cool inside the container. Due to the size, shipping/freight fees will apply. Based on recent quotes on UShip.com, the average shipping cost was $500 to more than $3,000, depending on the size. Because of size, bigger lots may be required to store them if you don’t have space. One way to keep the containers from rusting and in good shape will be with a simple paint job. While optional, it’s highly recommended you pay with an industrial-based alkyd enamel. Shipping containers can take a beating as they arrive at its destination, and repairs may be needed upon arrival. Some common repairs include the doors not shutting properly, the seals breaking, holes on the sides or a flooring issue. Doors, depending on the size, can cost $300 to $900, while a new lockbox will cost about $50 to $200. Lockrods and newer handles can cost about $100 per set, while rubber gaskets, which fitted to the container to prevent water damage, can cost about $45. These are all prices for the parts only and won’t include professional labor. To have a professional fix the issue, this can be two to three times the amount. If you’re going to store a container on your property, check with your local city to know the rules/regulations as many have restrictions on what you can and can’t place on your property. If you plan on storing the container in inclement weather or near the ocean, look for one made from corten steel. This material can stand up to almost all weather without rusting. “No shipping label,” a commonly used term on classified ads means the cargo container will have no logos and will be a plain color. A “cargo worthy” container, another term you may see, means it has been inspected by a cargo surveyor. A “one trip” container means it has only been shipped one time and will be in close to new. To see what a container can cost in your area, Western Container Sales offers an easy-to-use cart system, showing you what it would cost for certain sizes. Before purchasing, try to inspect it in person to check for any signs of damage. Closely inspect the roof, flooring, doors and walls to see if there are any signs of rust. Also, make sure the doors closely properly. When buying used, make sure you play it safe and call the number located on the side to make sure the person selling it to you really owns it. Highly consider eBay to find second-hand containers. This is a great way to save up to 60%. Another great resource is to check out Craigslist, where you can find local businesses getting rid of old cargo containers either because they have purchased a new one or even because they are going out of business and need to liquidate their company. If you only need the container for a few months, highly consider renting as this will be the cheapest option. Bulk purchases can often bring the “per unit” price down. Always haggle when purchasing. Since there’s an overload of these containers at most ports, sellers are willing to work out a deal. If anything, try to get free shipping out of the deal.